All that and more in this edition of ‘This Week in Wrestling‘. Does anyone else get the feeling that The New Day have been created as cannon fodder for The Ascension? A question to anyone who voted on the Paul Heyman/Chris Jericho match on Raw – what are the differences between an Extreme Rules match, a No Holds Barred match and a Street Fight? Have we just become desensitised to violence? Last Sunday’s TLC was a pretty mediocre show. It wasn’t terrible, it wasn’t a one out of ten show but nor was it an eight out of ten. It sits at the 5/10 mark. Not offensive but not great. I should probably declare early that I am not a fan of the PPV or, indeed, the general concept. Listening to various podcasts and reading the usual websites makes me think I’m not the only one with that opinion. During the Ryback versus Kane match last Sunday, despite repeated chair shots, the fans in attendance weren’t impressed and “boring” chants broke out. Sure, it could be a slight on Ryback who really shouldn’t be in lengthy matches if his gimmick is to work or maybe it was a reflection on the staleness of Kane’s character. Or, repeated chair shots on a payperview full of gimmick matches don’t pull the same punch they once did. It was something that we covered ahead of TLC in a Sunday Sermon when we questioned how what had happened previously could ever be bettered. I’m still adamant it won’t be bettered and superstars are still being asked to take significant risks with little, or no, pay off. Not content with a TLC match we also had a tables match, a ladder match and a table match. Hell, this year we also had a steel chairs match – a concept that I doubt won’t be used again. It’s absolute overkill, especially when you consider the information we now possess on the health of wrestlers. The risks these superstars take on a daily basis are high enough without them being asked to fall of ladders, be struck with chairs or be sent through tables. Especially, when they are moments that aren’t talked about. What is the point of TLC now? The same goes for the other ppvs of this ilk that are packed full of gimmick matches. What chance do the superstars have other than to put their body on the risk if they want the crowd reaction they crave? What chance did Dean Ambrose and Bray Wyatt have in their TLC match when, of the previous 8 matches, four featured weapons in one way or the other. In tomorrow’s Sunday Sermon we look at this year in wrestling and our hopes for next year. One thing I’d like to see an end to is PPVs like TLC. I love Lucha Underground. It’s probably my favourite thing in wrestling at the moment, well that or NXT. It really is the perfect TV wrestling show. At less than an hour it leaves you wanting more and not drained, the commentators sit and discuss the action in the ring and not matches taking place later in the show or what is trending on twitter and the product itself is aesthetically unique. The backstage segments look like something out of a film which sets it apart as does the setting of the entire show in a basement. I’ve been contemplating the promotion and haven’t even mentioned the in-ring work. That itself is also different from what you’ll see elsewhere. 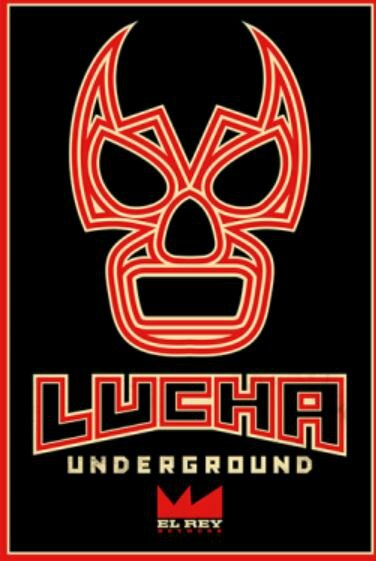 Lucha Underground showcases the very best talent from Asistencia Asesoría y Administración (AAA) and the American Independent scene and, in seven episodes, has put out some outstanding and unique match-ups. We’ve seen inter-gender matches where the female competitors have went head to head with male counterparts and we’ve even seen a male superstar take on a midget. It’s also seen the welcome return of the former WWE superstar John Morrison to the squared circle as Johnny Mundo. He’s been involved in some of the major storylines – feuding with Lucha Undergound Champion Prince Puma, indy star Richochet and having issues with on-screen authority figure Dario Cueto which culminated in the ladder match main event at episode 7. I honestly can’t hype this promotion more. Give it a shot – on El Ray Network if that’s available to you or look for individual matches or shows online. You really won’t be disappointed. 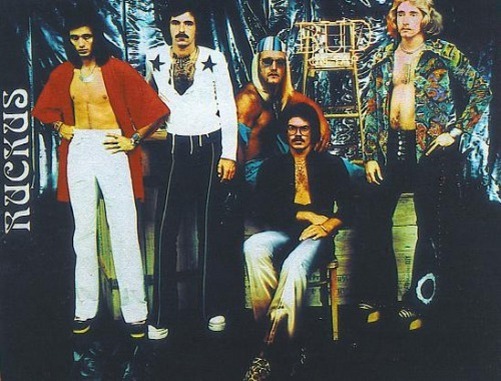 Before Hulk Hogan and Hulk-a-mania…there was Terry Bollea bass player for the band called Ruckus. Hulk said of his past career…he was so good…he almost joined Metallica….errrr okay…. It may be good to be the king….but you sure as heck don’t know where that crown has been…. What’s a Saturday without Saturday morning cartoons? 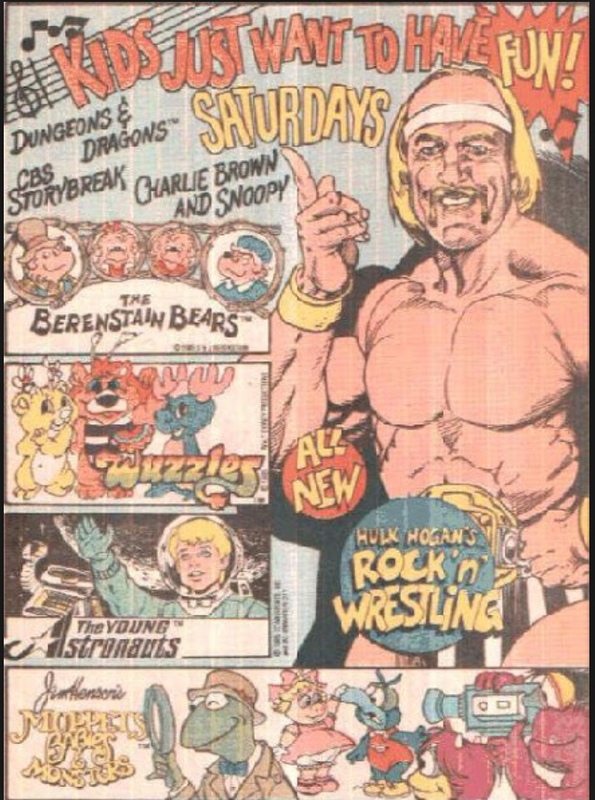 Here’s an old ad featuring the WWF’s venture into the once rich Saturday cartoon landscape way back when…. 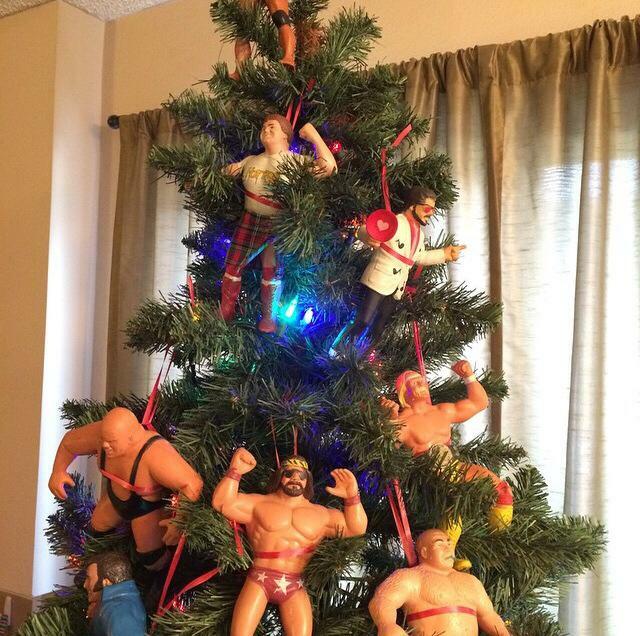 By the way, in case you were wondering….the tree topper is Jimmy ‘Superfly’ Snuka. How’s this for a last minute gift idea? 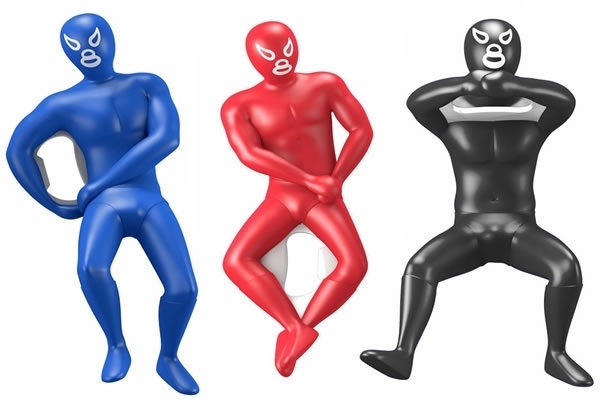 A luchador bottle opener…it comes in three different moves! 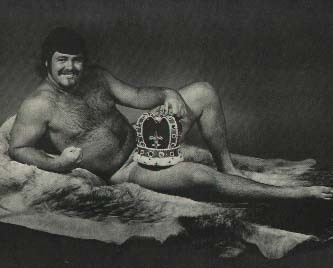 Dr. Death Steve Williams wasn’t exactly known for his stellar promos. So why not just have him interrupt the Midnight Express by acting like Superman…. In the “What the F was the promoter thing?! ?” department…. Meanwhile in Japan…you know Kenta Kobashi and the late Mitsuharu Misawa are a really big deal…..trust me! ‘This Week in Wrestling’ columns can be read here. This entry was posted in Lucha Underground, This Week in Wrestling, WWE and tagged Dr Death Steve Williams, Hulk Hogan, Hulk Hogan Ruckus, Hulk Hogan's Rock n' Wrestling, Jerry 'The King' Lawler, Jim 'The Anvil' Neidhart, Kenta Kobashi, Lucha Underground, Mitsuharu Misawa, Ryback vs Kane, Tables Ladders & Chairs, This Week in Wrestling, TLC 2014, Virgil, What wrestling taught us this week, WWE Raw. Bookmark the permalink. I have never liked the concept of TLC. Used sparringly, the idea works well, but when this happens so damned frequently, well, it just loses its luster. The reason why the TLC match between the Hardyz, the Dudleyz and Edge & Christian at Wrestlemania 17 was because it was novel and fresh. And it was a grand slam in any way that you saw it. But now this is used so often, there’s no spark, no magic left. But my biggest problem with TLC is that it puts all that much more pressure on the wrestlers to pull out all of the stops. And some are not cut out for that. There is no telling at this point just how many years have been shaved off of the grapplers’s lives because they felt it was demanded of them to do so. If I had been a wrestler, I’d have told Vince to stuff it, that it just was not worth the eventual pain, numbness, memory loss and internal injuries that TLC brings. It just isn’t faitr to ask someone like Daniel Bryan to be Cactus Jack. Hell, it ain’t even fair to Mick Foley to ask him to be Cactus Jack. This has got to stop. Or we may eventually see someone drop dead for real in the middle of a WWE ring due to a fatal chair shot or perhaps an errant kendo stick breaking and stabbing someone’s liver.